New 2019 U.S. Postal Service rates go into effect on Sunday, January 27, 2019. Stamps.com has compiled all you need to know about 2019 USPS rates in the new 2019 USPS Postage Rate Increase Guide. This guide will help you better understand the new USPS rates and how they may affect your business. 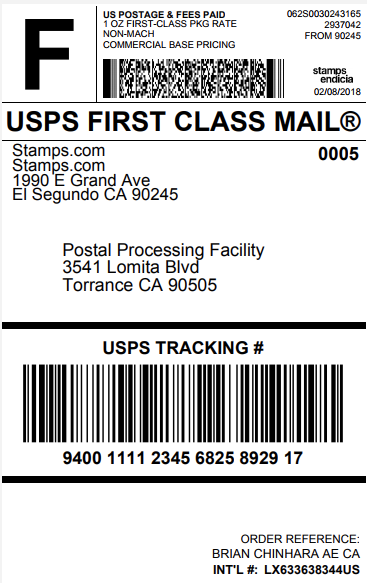 Each mail class is presented with side-by-side comparisons between the current postage rates and the new 2019 postage rates, both for customers who buy postage at the Post Office and for customers who print postage online (using Stamps.com), taking advantage of discounted shipping rates. When it comes to your online e-commerce business presence, creating your “About Us” page requires careful consideration and attention to detail. When customers visit your website they often want to learn more about your company such as who is behind it, how long has the company been in business, and what is the company’s mission statement. The following will help guide you to the creation of an optimum “About Us” page using this handy checklist. The ‘About Us’ page doesn’t have to be dull and straight to the point. Get creative and have fun with this page by using a modern and fun tone that is inviting to your visitors. One example could be with the use of a conversational tone that makes the customer feel invited and valued. Be upbeat and enthusiastic in your writing and this will come across as a company that is both modern and fun! Giving your readers specific detailed information about who you are, where your company got its start, and the essence behind you and your products/services helps customers better understand where your passion lies and why they should be giving their business to you. Does your company give a proceed of sales to charity? Be sure to include this because customers enjoy shopping for a good cause! In continuing with the idea of giving your customers an inside look at who you are and what your company’s mission is, don’t forget to give attention to customer perception. You want to be sure that your tone and message doesn’t come off as vain. While showcasing all your company’s achievements seems relevant on this page, consider how to feature them without giving the impression that you are bragging in any way. Instead, the perception you want to give to your customers should be one that is friendly, caring, and attentive to their needs. One way this could be done effectively is by adding a few of your customer’s personal reviews of your products so that customers can see for themselves why they should shop with you. The average cart abandonment rate is 69.89%. Of the number of people that make it all the way to checkout, 25% will leave without completing their purchase. Whichever way look at it, that’s a sizeable number of lost customers and revenue. What’s more, the situation is even worse on mobile. Overall ecommerce conversion rates usually lag around two percentage points behind desktop. So how can you go about recouping some of those sales? Top companies have cut down their checkout abandonment rate to around 13%. And the simple truth is there’s nothing particularly complex about the tactics they’ve used. By avoiding a handful of common mistakes, and making a few minor tweaks, you should be able to bring your own rate to a similar level. If you look at Crutchfield’s checkout process, you’ll see that customers only need to move through three stages to make an order. It’s worth attempting to achieve the same number of steps (or even less) with your own checkout process. Crutchfield’s checkout process is made up of only three steps. There is one caveat, however. On mobile devices, it’s better to fit all information into one screen-sized page. If that means more than three pages, then it’s a trade-off that’s usually worth making. Making customers scroll up and down can add unnecessary friction to the buyer journey. During the checkout process, you have one aim – to close the deal. Checkout pages are not the place to promote your upsells and cross-sells. What’s more, unnecessary page elements, that might cause a customer to click through to another area of your site, should be minimized. This is especially the case on mobile, where space is at a premium and it’s easy to accidentally tap the wrong button. Simply Hike removes all unnecessary elements including the menu and footer. It just leaves the logo, performance indicator and phone support. Some online retailers, like Zappos, have gotten rid of everything! If you want to go down that route, however, testing is a must! If you need to include extra information, do so in the form of toplayers (top-of-the-page pop-ups) that will open a new window when clicked. Or, even better, place them strategically while making them easy to click. Scott Hurff created a “Thumb Zone” map that shows the spots to avoid when deciding where to place your crucial elements. Ensure you avoid the hard-to-click areas. Use Scott Hurff’s “thumb map” when designing your pages. What’s more, remember that visitors use their left hand to operate their mobile devices 30% of the time. Also, keep in mind that left-handers constitute around 10% of the population. So don’t put everything on the right-hand side of the screen! Which hand do you use for your smartphone when you drink a coffee or eat a donut? Make all tappable elements, like buttons or form fields, screen-wide. Make sure your CTA buttons are colorful and stand out. Don’t force users to tap precisely on checkboxes when subscribing to a newsletter or agreeing to the terms and conditions — make the whole line tappable (if they tap on the instruction, for example). Enable guest checkout and place the CTA strategically. Unless 90% of your users are returning shoppers, the guest checkout button should be one of the first options during the checkout. At Asos.com you can choose whether to register or simply continue to checkout. Here’s a pro tip. Copy Spring and ask for an email address before letting a user proceed. This way, you can reach potential customers if they do abandon their cart during checkout. If there’s one thing you should take away from this post, it’s the simple maxim that “less is more” when it comes to customer checkout. You want users to undertake one (and only one) action – and that’s to complete the purchase! Anything that prevents them from doing this should be dropped! And, as always, don’t forget to test the results of all the tweaks you make. While these tips will set you in the right direction, consistent testing will enable you to find your own winning mix! Are you looking for more ideas to grow your ecommerce conversion rate? I bet you do! If I bet right, you should get our Ultimate 115-point Ecommerce Optimization Checklist which we use with our clients to dramatically increase their conversion rates and sales. The Ecommerce Optimization Guy who helps 7 & 8-figure online retailers get guaranteed revenue uplifts in a dev-free way. To get more of Pawel’s content subscribe to Growcode’s Ecommerce Optimization Blog and Bite-size Ecommerce Optimization on YouTube. Connect with Pawel on LinkedIn, Twitter and Instagram.